Whether you’ve scheduled construction downtimes on weekends, summers, or holidays, or within off-hours of the day to minimize disruption from necessary renovation and repair, Black Bear is trusted by more public and private institutions for cost-effective, reliable school flooring. 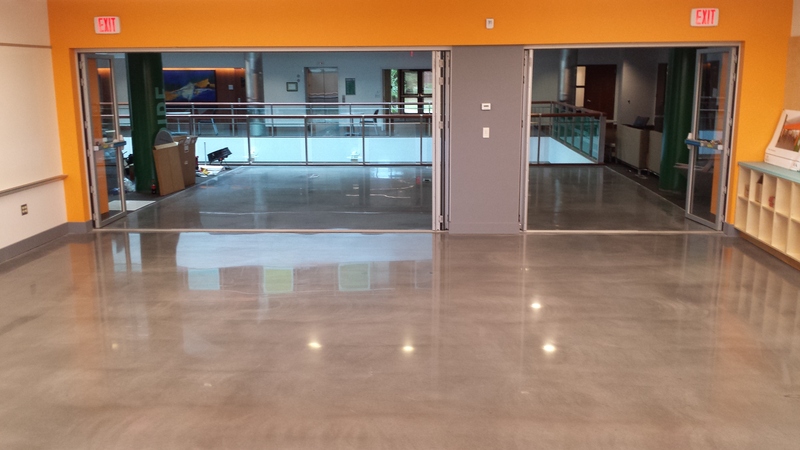 Our team understands that there’s more to school flooring considerations than just hallways and classrooms. Different areas of study such as science and technology labs may require additives and supplemental engineering to ensure safety and durability under the unique environmental impact. Wet spaces such as locker rooms, cafeterias, and lavatories require individualized solutions to withstand moisture, mold, and sanitization. Cafeteria flooring must endure temperature changes and heavy equipment from freezers and ovens. Each space must be adequately assessed in order to engineer the right school flooring solution. Black Bear knows that a complementing design is also important in today’s educational facilities. Which is why we offer school flooring solutions that can illustrate your school’s spirit with colors logos, mascots, and mottos. From parking areas to stairwells, auditoriums to lecture halls, Black Bear’s experienced installers evaluate a campus and adjacent areas to understand how a space is used and what attributes may compromise efficacy. We reverse engineer a commercial flooring solution that can resist the elements and provide greater durability and longevity to reduce the need for subsequent repair. Black Bear saves you money by installing optimal flooring that outlasts and outperforms other systems. Check out our work for schools such as Babson College, Harvard University, St. Bernards High School, and Miss Tanya’s School of Dance. Learn why more our team is chosen to design and install the best commercial school flooring and university flooring solutions in the Northeast. Talk to Black Bear about designing and installing a cost-effective, durable surface for your school and university floor spaces. Fill out the online form and a client representative will be in touch. Or, please call 978-405-0017. To learn more about industrial flooring for the education industry, check out our guide to choosing the right flooring for universities and other educational institutions.